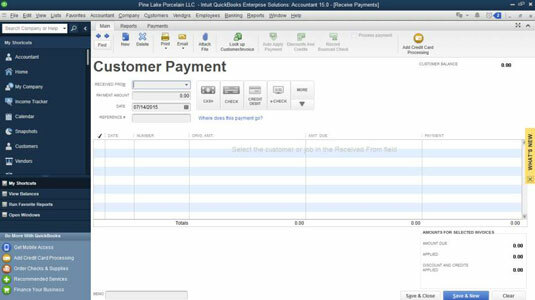 QuickBooks 2015 makes it easy to record customer payments. If your customers don’t always pay you upfront for their purchases, you need to record another type of payment: the payments that customers make to pay off or pay down what you’ve invoiced them. To record the payments, of course, you first need to record invoices for the customer. If you issue credit memos that customers can use to reduce the amounts they owe, you also first need to record credit memos for each customer. The rest is easy. To access a wealth of customer information all on one page, click the Customers icon on the icon bar or choose Customers→Customer Center. The Customer Center appears, listing outstanding balances for all customers and detailed information for the customer selected in the Customers & Jobs list. The Receive Payments window appears. Identify the customer and, if necessary, the job. Activate the Received From drop-down list and select the customer (and job, if necessary) by clicking its name. QuickBooks lists the open, or unpaid, invoices for the customer in the list box at the bottom of the window. Press Tab to move the cursor to the Date text box and type the correct date in MM/DD/YYYY format. To edit the date, you can use the secret date-editing codes. 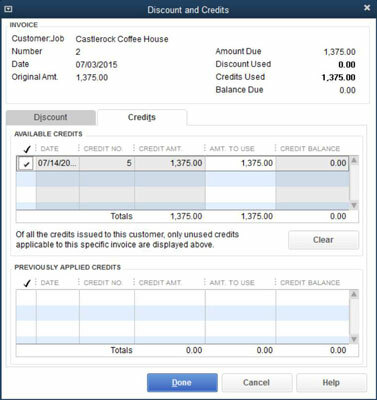 Move the cursor to the Amount field and type the customer payment amount. Note: If the customer is paying with a credit card and your merchant bank deducts a fee from the individual payments, record the full amount of the payment on this payment screen and the merchant fee later on the Deposit screen. (Optional) Specify the payment method. Activate the Pmt. Method drop-down list and choose the payment method. (Optional) Enter the check number. You can guess how this works, right? You move the cursor to the Reference # field. Then you type the check number from the customer’s check. Do you need to complete this step? Nah. But this bit of information might be useful if you or the customer later ends up with questions about what checks paid for what invoices. (Optional) Add a memo description. Use the Memo description for storing some bit of information that will help you in some way. Note that this field prints on the Customer Statement. If the customer has any outstanding credits, decide whether to apply them in this payment. QuickBooks totals the amounts of any of the customer’s existing credits. They can be anything from an overpayment on a previous invoice to a return credit or anything else. When you create a new invoice, QuickBooks notifies you that there are credits available on the customer’s account and asks whether you want to apply any of them to the new invoice. If you want to apply a credit memo to a specific open invoice, select the invoice and then click the Discounts & Credits button. When QuickBooks displays the Credits tab of the Discount and Credits dialog box, click the credit memo that you want to apply and then click Done. Identify which open invoices the customer is paying. By default, QuickBooks automatically applies the payment to the open invoices, starting with the oldest open invoice. You can change this application by entering amounts in the Payment column. Simply click the open invoice’s payment amount and enter the correct amount. You can leave a portion of the payment unapplied if you want to. QuickBooks then asks what you want to do with the overpayment: You can leave the amount on account to be applied or refund the amount to the customer or client. If you record an underpayment, QuickBooks asks whether you want to just leave the unpaid amount sitting there or want to instead write off the remaining balance. If you want to apply the customer payment to the oldest open invoices, click the Auto Apply Payment button. If you want to unapply payments that you already applied to open invoices, click the Un-Apply Payment button. Un-Apply Payment and Auto Apply Payment are the same button. QuickBooks changes the name of the button, depending on whether you already applied payments. Adjust the early payment or other discounts, if necessary. 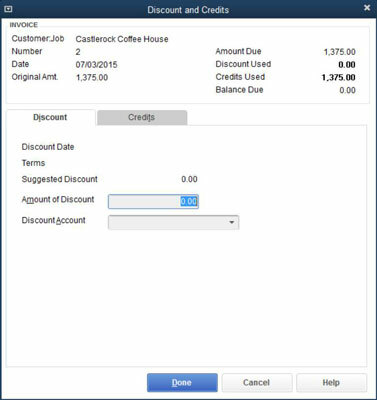 If you offer payment terms that include an early payment discount, QuickBooks automatically reduces the open invoice original amount by the early payment discount that you specify to calculate the adjusted amount due if the payment is dated within the discount period. To specify any other discounts, select the open invoice that you want to adjust. Then click the Discount & Credits button. With little or no hesitation, the Discount tab of the Discount and Credits dialog box appears. Type the dollar amount of the discount in the Amount of Discount text box. Then specify the expense account that you want to use to track discounts by activating the Discount Account drop-down list and selecting one of the accounts. When you’re finished, click Done to return to the Receive Payments window. Record the customer payment information. After you identify which invoices the customer is paying — the unapplied amount should probably show as zero — you’re ready to record the customer payment information. You can do so by clicking either the Save & New button or the Save & Close button. QuickBooks saves the customer payment shown onscreen. If you click Save & New, QuickBooks displays an empty Receive Payments window so that you can enter another payment.